Avian Influenza has been found on poultry farms in four counties around Wisconsin; the closest being Jefferson County, where two farms have tested positive for the disease. Since this is a highly contagious disease and because of its proximity to Dane County, poultry producers and small flock owners should be concerned and take steps to protect their birds. Avian Influenza or H5N2 or “bird flu” is a highly pathogenic virus that infects domestic poultry, such as chickens, turkeys, pheasants, quail, ducks and geese. It also affects wild birds, in particular waterfowl. The virus spreads through direct contact with infected birds, contaminated objects/equipment, and aerosol (only over short distances). The virus is found in feces, saliva, and respiratory secretions of infected birds. It spreads rapidly and has a high death rate. Biosecurity is vital during an outbreak and even before an outbreak occurs. Biosecurity is the implementation of best practices to prevent the spread of diseases. It is important for all poultry producers, no matter the size of their operation. The following are some steps you can take to protect your flock from Avian Influenza. These are taken from the Department of Agriculture, Trade, and Consumer Protection’s (DATCP) press release and are good information for anyone with poultry. • Keep your distance—Restrict access to your property and keep your birds away from other birds; try to reduce contact with wild birds. • Keep it clean—Wash your hands thoroughly before and after working with your birds. Clean and disinfect equipment. • Don’t haul disease home—Buy birds from reputable sources and keep new birds separated for at least 30 days; quarantine returning birds from the rest of your flock after visiting a poultry swap, exhibition or other event. • Don’t borrow disease—Do not share equipment or supplies with neighbors or other bird owners. If you must borrow, disinfect it first. • Know the warning signs—Early detection can help prevent the spread of the disease. Check your birds frequently. If you find a sick or dead bird, don’t touch it. • Report sick birds—Don’t wait. If your birds are sick or dying, call DATCP at 1‐800‐572‐8981. Currently there are no human health concerns for this strain of avian influenza. It is safe to eat properly prepared poultry products, including meat and eggs. 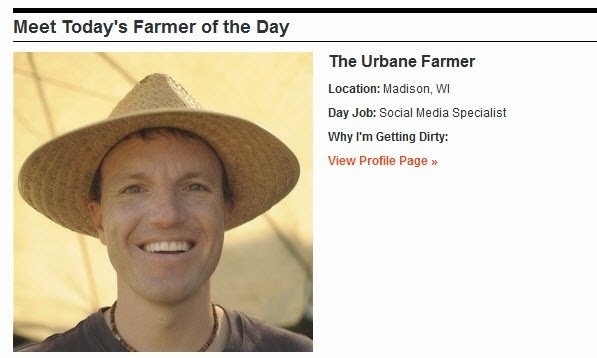 I just got an email that I'm Urban Farm.com's "Farmer of the day!" Going through the list of items from the "How to build community poster," I knew there would be a couple of easy ones. 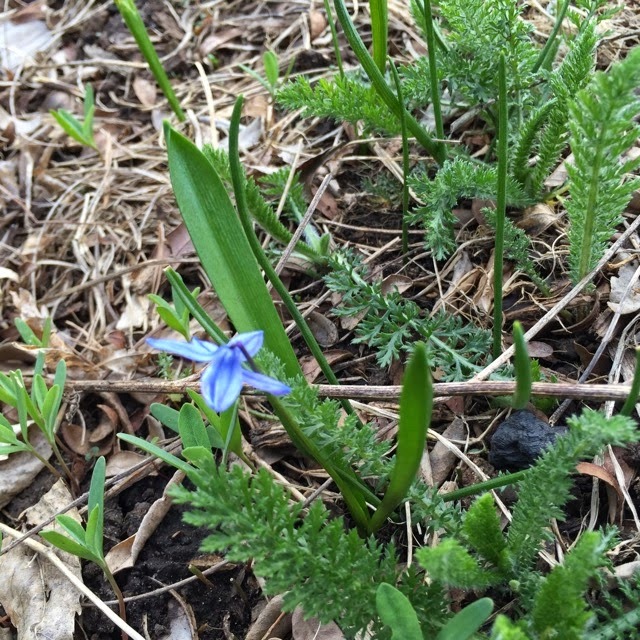 Today I'll pick "Plant flowers." 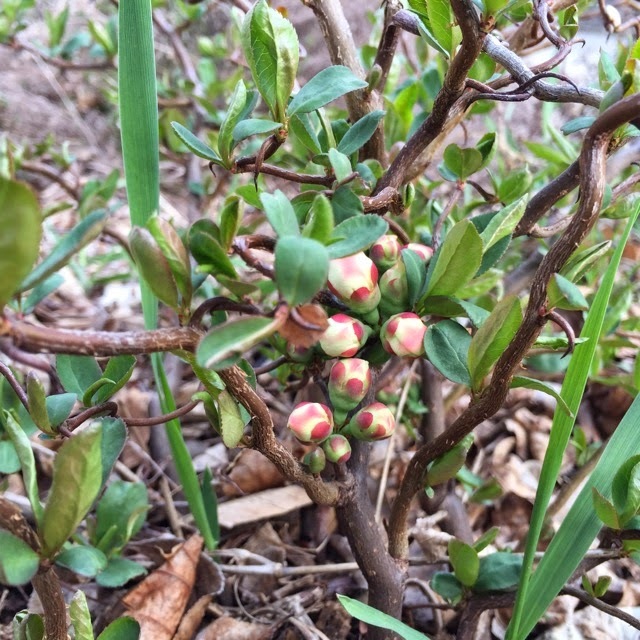 When we installed the orchard I knew the trees and shrubs would eventually flower in spring, bear fruit in fall and add winter interest under the snow. 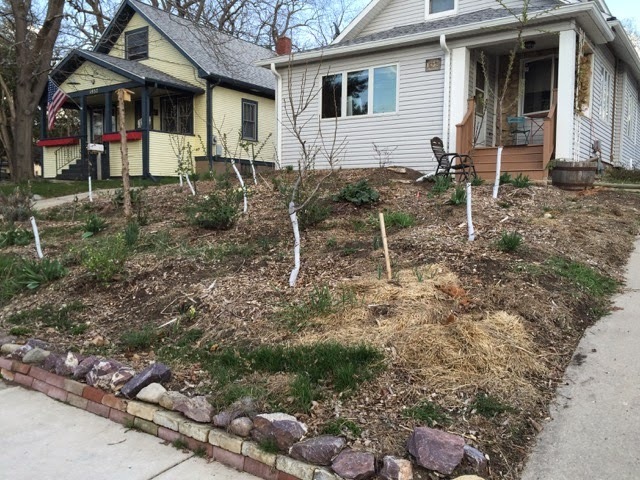 As with most new construction, the orchard started out drab and sparse. 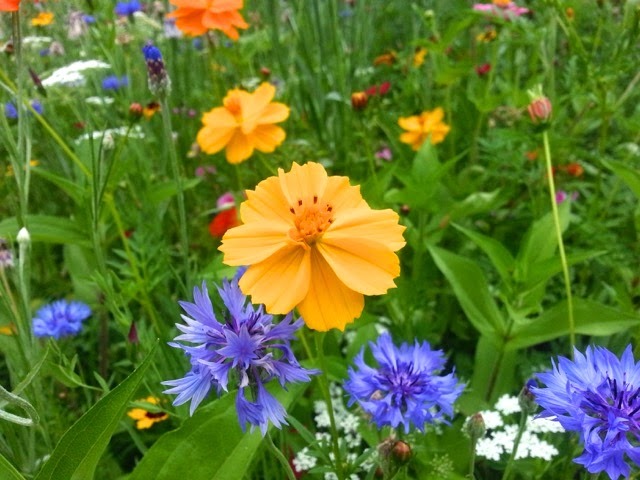 When I sowed the groundcover clover seeds, I mixed in a variety of marigold and zinnia seeds, wishing them well as they fluttered to the ground, and hoping at least some would germinate on their own. 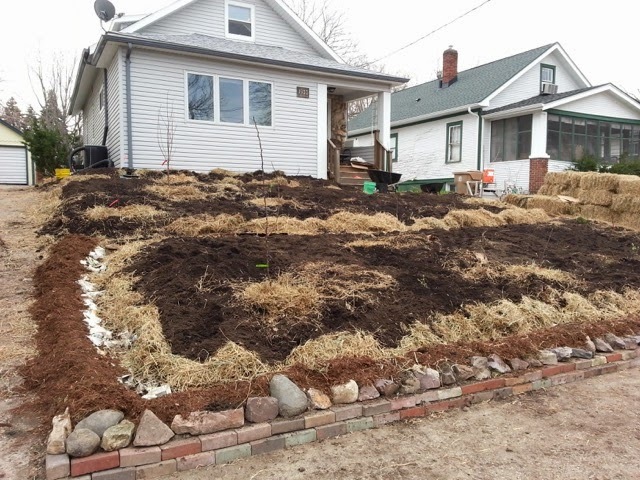 The terrace, as we call the strip between the sidewalk and the street here in Madison, was also a barren canvas on which to plant some flowers, and I threw down several packets of perennial seed mixes with the hope that a few would germinate and show some summertime color. 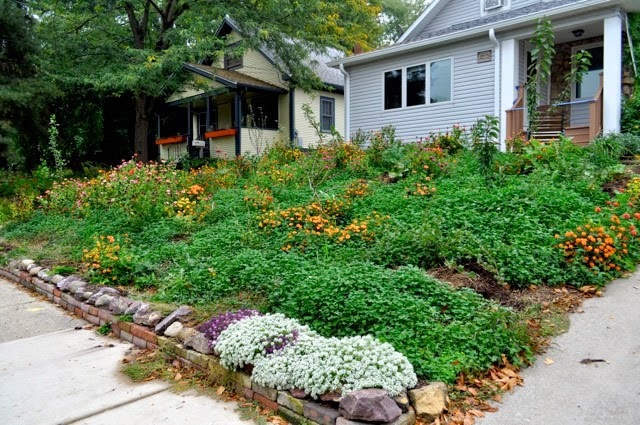 And then there are the alyssum plants that my neighbor added to our front yard orchard. 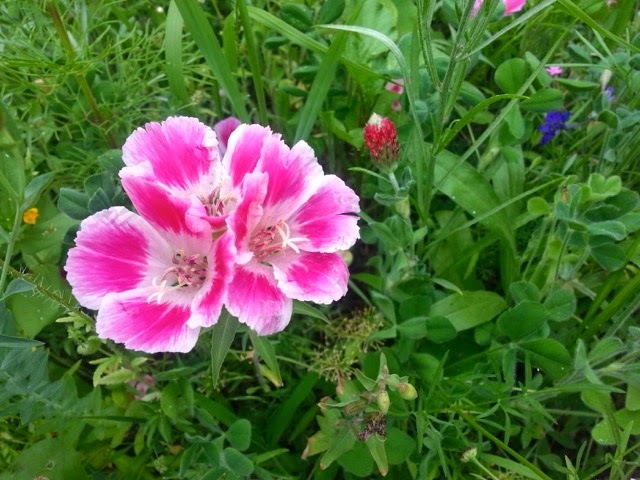 I planted them at the bottom of the driveway and they grew into wonderful pillows of white and purple flowers. 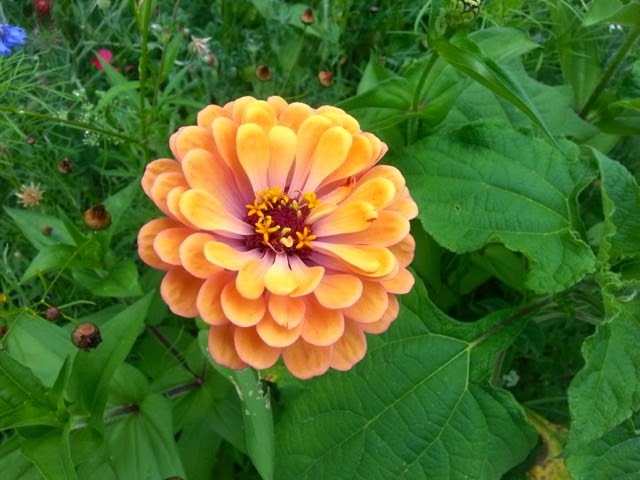 That summer, many marigold and zinnia seeds germinated and flowered, and the orchard was a riot of color for several months. 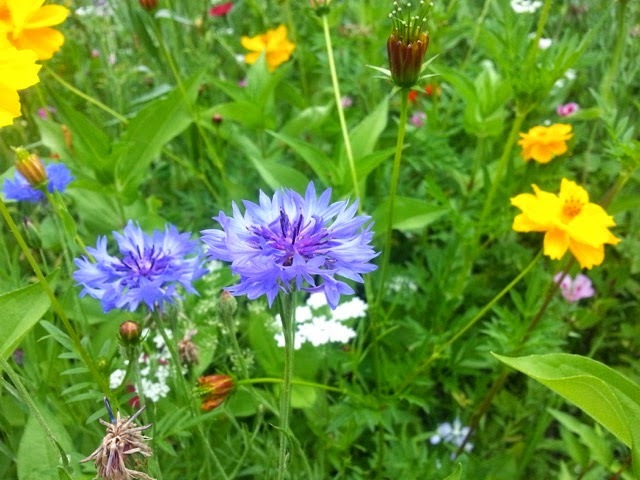 The terrace seeds also germinated and are now a perennial source of beauty and pollen where in the past there was nothing but grass. 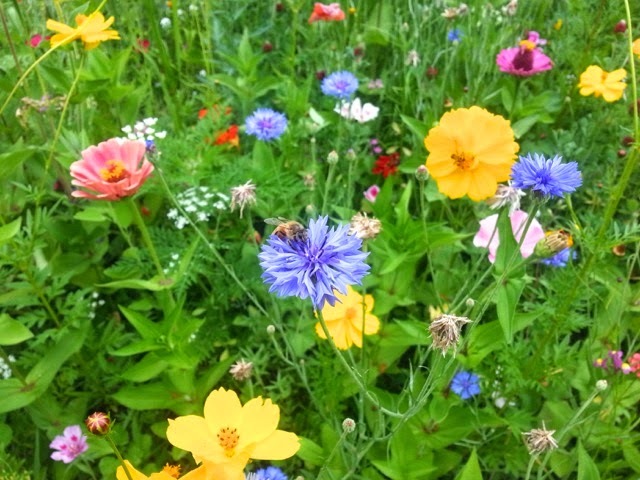 So how does planting flowers build community? I think there's a number of ways flowers add to a neighborhood. The first is it slows people down. I think that flowers can soften the hardest of hearts and slow down the fastest drivers, even if for a brief glance upon their soft and delicate aspect. 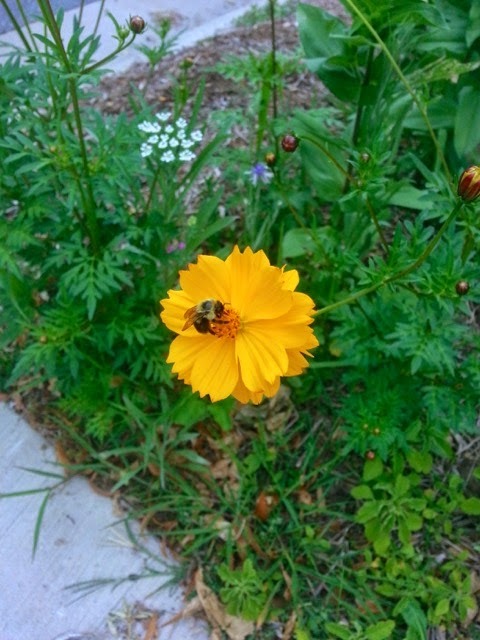 I think planting flowers shows passersby that this is a place where the owner respects not only the soil but the neighborhood, the bees and all other things that benefit from beauty. 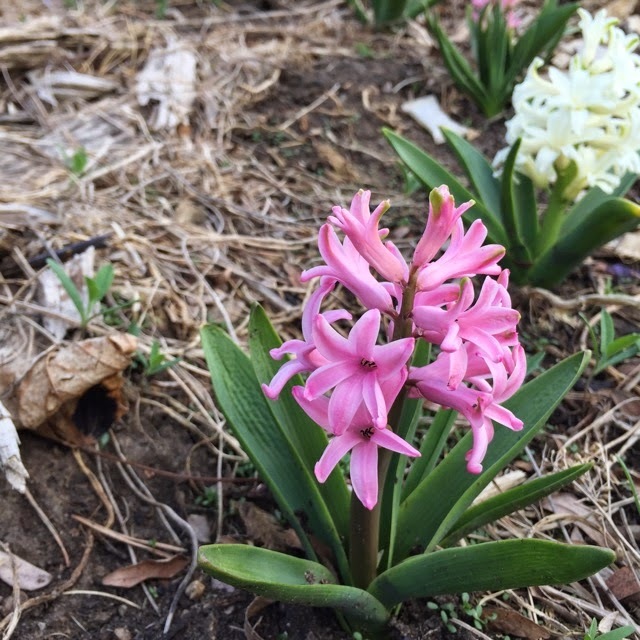 Is it possible that it's more difficult to throw trash among flowers than upon bare soil or a gravel lot? Flowers, or anything beautiful for that matter, offer something to talk about. "What is that flower?," or "Have you smelled of this one?" I think children are innately curious about the beauty of flowers and we can all (re)learn to stop and smell them once in a while. 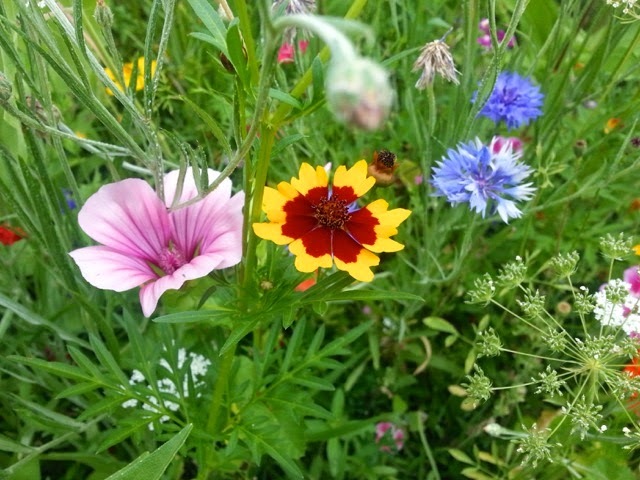 Flowers also add diversity to the landscape, in my case, breaking up patch after patch of mown grass, adding some height, some color, some scent, home to insects and refuge for birds. But most of all, I think flowers offers refuge for the human mind to land on and pause and wonder, for just a moment, at the beauty of a plant that comes from a seed to become a flower for all to enjoy, even if just for that moment it's looked at. This will be the third summer but only the second spring for our front-yard orchard. Since it was built in late April, none of the springtime ephemeral flowers had been planted yet. 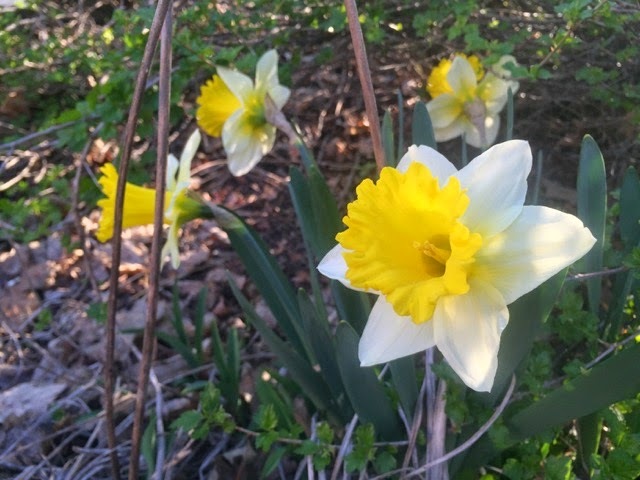 We have three varieties of daffodil, known to me as early, mid and late season. The contorted flowering quince has thus far only contorted, but it looks like this year it's going to flower too! 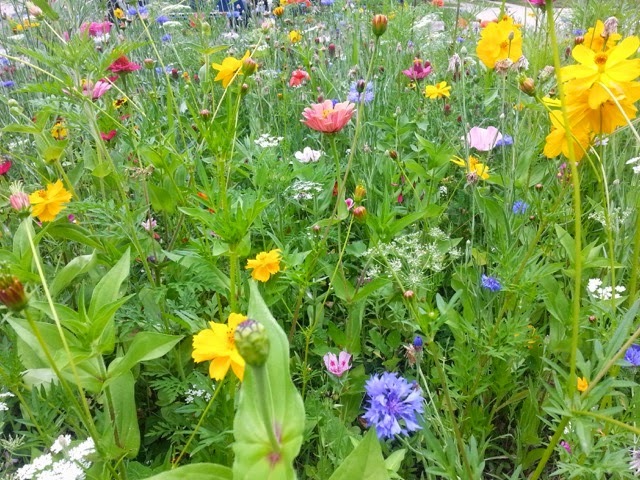 Go on, bend down and smell the flowers! 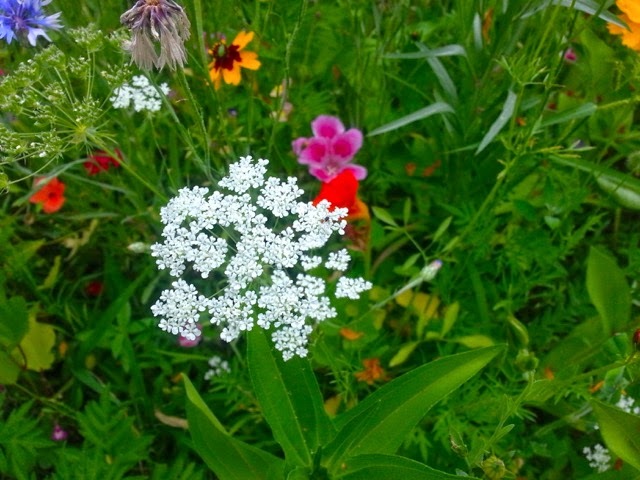 I don't recall what this dainty flower with ferny leaves is called. There are also buds on the trees and the rhubarb is coming up. NEW CONSTRUCTION - be the first to live in this cozy one-bedroom house located in the middle of a private orchard. Looking to rent to a bachelor wren seeking a safe place for this spring's prospective family. House is sunny, dry, and made of western cedar (no moths eating your sweaters!) The fortified entry ensures no other birds get in; you can safely raise a family in this secure house. The entry is oriented to protect you and your family from western wind and rain, and has a bird's eye view of the cherry tree. Included are all-you-can-eat insect buffet, annual cleaning service, WiFi, water, sewer and protection from cats and other predators. If you really like the Nature Channel, we can add cable on request, but you'll have to pay for the hookup. Rent is a barter; free housing in exchange for protecting neighboring fruit trees from other birds. This weekend I installed a wren house in the center of our front-yard orchard. Any idea why a wren house in particular? Wrens are insectivores, they only eat insects. Good for me, and good for my orchard trees and shrubs. Wrens are very territorial. That means they don't like other (fruit-eating) birds in the neighborhood. This is also good for me, because I might have a chance of getting a cherry or a honeyberry. 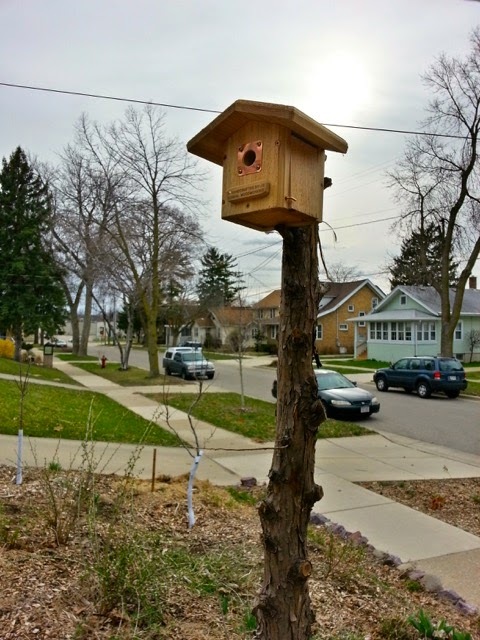 I bought this cute house at the 2015 Wisconsin Garden Expo, and the "post" is from one of the cyprus trees that we had removed from the front yard before we installed the orchard. 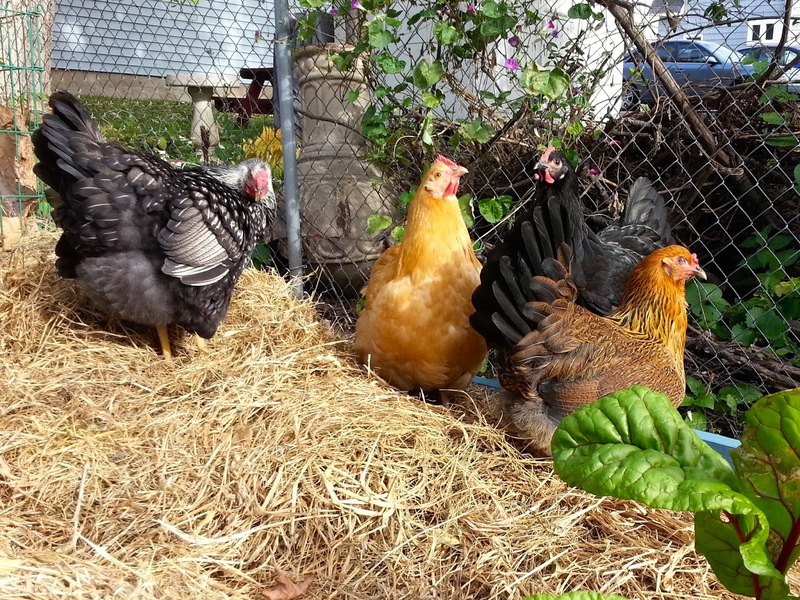 June 6, 9 a.m. - 1 p.m., self guided chicken coop tour. Use this map to find unique, colorful and fun coops, and lots of ideas, including The Egg Plant at 1933 E. Mifflin St. I do composting on a big scale - in autumn, I collect curbside leaves, grind them up and mix them with coffee grounds and let them cook for six months to make great compost and mulch. I also participate in Madison's "black bin" curbside compost recycling for weeds and foodstuff we can't compost like Brussels sprout stalks, and things the chickens shouldn't eat. ... but what would I do with those Brussels sprout and kale stalks?